Enjoy a weekend of fantastic displays from some of the world’s most iconic aircrafts. The highlight will undoubtedly be the RAF Red Arrows, scheduled to arrive at midday on the Saturday for a 23-minute aerobatics display. There will also be a Battle of Britain Memorial Flight, involving a Lancaster, two Hurricanes, a Dakota and several Spitfires, as well as highlights such as the Tigers Freefall Parachute Team and helicopter displays. Don’t miss the Cosford Airshow when the Royal Air Force Aerobatic Team will showcase their precision and skill with an incredible Red Arrow display while you will also be treated to a variety of military aircrafts on display, including the BBMF Spirtfire, the Typhoon FGR4, and the Tucano T1. 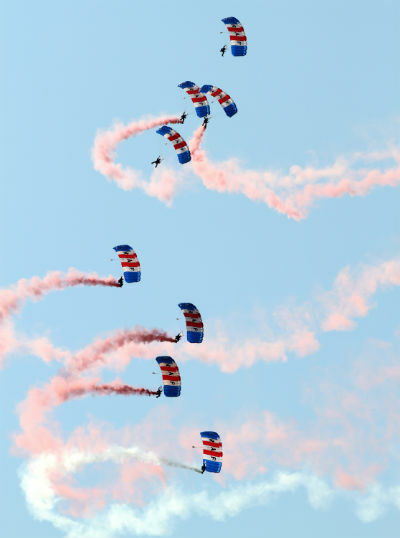 The RAF Falcons, the military parachute display team, will also be dropping in to open the flying display. The 50th display season at Biggin Hill Festival of Flight includes all the favourites with The Red Arrows, Spitfires and The Blades Aerobatic Team. Expect spectacular things from the Breitling Wing Walkers and the Raiders Parachute Display Team from the Royal Navy, and the Red Bull Matadors are bound to put on a good show. This fantastic event put together entirely by volunteers not only celebrates aviation and classic cars but will also be raising money for The Royal British Legion, Help for Heroes, and Fallen Fusiliers. Enjoy a day out admiring military vehicles and aircrafts, listening to live music and feasting at the BBQ. Held in Billericay, the South Essex Armed Forces Day shows its support for UK troops with world class displays from The Gnat Display Team, the Great War Display Team with nine aircraft, Supermarine Spitfire, Hawker Hurricane and the Tigers Parachute Display Team. 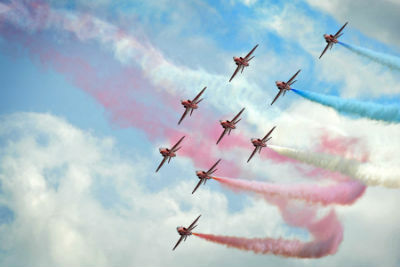 As the home show for the Red Arrows, the 2014 RAF Waddington International Airshow will be largely celebrating the Golden Anniversary for the Royal Air Force Aerobatic Team. 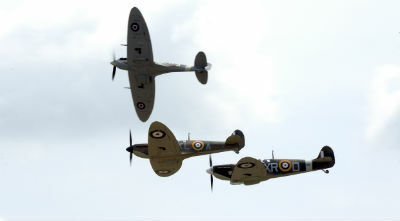 This is a truly spectacular RAF air show and also includes a classic car and vintage military vehicle exhibition. One of the top UK airshows, The Air Tattoo is a fantastic experience, showcasing thrilling flying action alongside plenty of ground entertainment and opportunities to meet the crews. Admire aircraft from all over the world including Lockheed Martin F-35B Lightning II, fighter aircraft from the US Marine Corps, and the F/A-18F Super Hornet of the US Navy, the Panavia Tornado IDS/ECR of the German Air Force, and, of course, the Red Arrows and a huge variety of aircraft of the UK. Renowned for its historic piston-engined aircraft in rare combinations and its entertaining flying displays, the Flying Legends Air Show at IWM Duxford is one of the highlights of the summer. 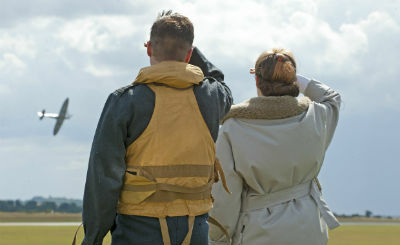 Experience the 1940s atmosphere in the museum and sit back with a Pimm’s to enjoy the world-class nostalgic flying display that lasts of three hours. 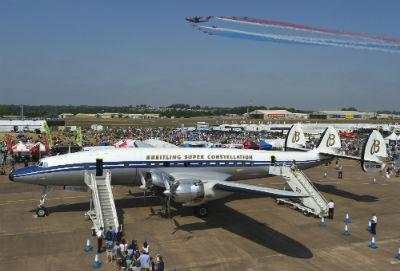 The Farnborough Airshow will be celebrating 100 years of Aviation History with a flying display lasting over four hours where the Great War Display Team will be taking to the skies, along with the Breitling Wingwalkers, the Aerostars and the Red Arrows. There will also be the chance to get up close to a variety of vintage aircraft on ground, with the opportunity to admire the Blackburn B2, the Bleriot XI and the Sopwith Camel among others. 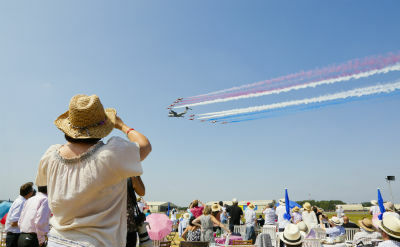 This award-winning airshow attracts thousands of visitors with its five-hour flying displays that include fast jets, history warbirds, helicopters, formation display teams and aerobatics. It ends with a bang with the Commando Assault Finale that will feature troops, aircraft and some pyrotechnic fun. Don’t miss out on this great day out for all the family. With the Red Arrows headlining, Scotland’s National Airshow at the National Museum of Flight will be a spectacular day out. The RAF’s supersonic Typhoon will be making an appearance, gluing at twice the speed of sound, alongside iconic aircraft Avro Lancaster, Spirfire and Hawker Hurricane. There will be plenty of activities, stalls and workshops too. Another great day at IWM Duxford, this event will be showcasing the legendary Supermarine Spitfire, the Merlin engine and a variety of classic and contemporary cars. As well as admiring these aircraft on ground, the day will be complimented with short flying displays. Old Buckenham’s resident Aerobatic Display Team will be putting on a display specifically for this airship and there will be a wonderful variety of aircraft thrilling the display crowds, including the Jet Provost, Spitfire MH434, Staggerwing, Yak 52 and Ferocious Frankie. This annual airshow is raising funds for the restoration of Avro Lancaster NX611 and has a brilliant list of confirmed aircraft on display with Captain Nevilles Flying Circus and the Breitling Team ready to wow, along with the Aerostars, the Trig Display Team and the Spitfire MKXIX. Fast jets, historic aircraft and parachute displays will take centre stage at Airbourne this year along with four Red Arrows displays. The four day free seafront airship is a must for the summer calendar with appearances from The Tigers, The Blades and the Royal Navy Raiders. This year’s Sywell Airshow is themed around the Centenary of The Great War with representative aircraft taking part in an aerial battle. The Red Arrows will be taking centre stage and there will be the opportunity to see a Lancaster from the Canadian Warplane Heritage Museum as well as the Battle of Britain Memorial Flight Lancaster. Military and vintage vehicles will also be on display. Not only a fun day out but also an opportunity to help raise funds for the Warwickshire and Northamptonshire Air Ambulance. Award-winning and free, the Clacton Airshow is always a fun day out and an opportunity to enjoy a host of incredible aerobatic displays. Like the Sywell Airshow, Clacton will be host to the only two remaining airworthy Lancaster bombers in the world. 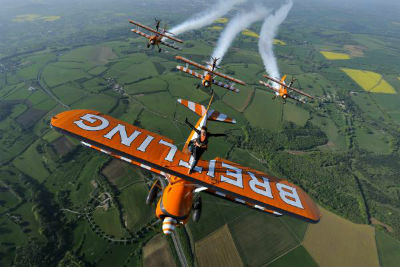 The Tucano will be flying both days and the Red Arrows will be performing on the 22nd. Every year the small seaside town of Dawlish is taken over by aircraft-enthusiasts eager to witness the remarkable air displays over the coastline. This year includes the Grob Tutor, the RAF Battle of Britain Memorial Flight, the Red Arrows, and the BAE Systems Hawk T1x9. Welcoming more than 5.8 million people every year, the Bournemouth Air Festival has been hugely successful since it began 7 years ago. 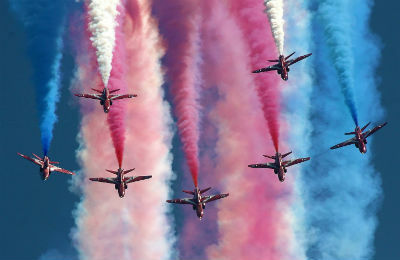 This year looks set to be another corker with displays from the Red Arrows, RAF Typhoon, and Army Lunx MK7. Ireland’s biggest airship is set to be a fantastic couple of days this year with a free weekend of air displays and ground entertainment. Spectacles include the Lancaster display and The Royal Navy Merlin display.